Part of Harrogate developer Adam Thorpe's vision for Crescent Gardens with its well-being centre underground. The Harrogate developer at the centre of the Crescent Gardens controversy says, in his view, he is still under contract on the £75 million plans - even though the council announced on Monday it had ended the legal agreement with his company ATP (Crescent Gardens) Ltd.
Adam Thorpe said his lawyer had been in contact with Harrogate Borough Council on Friday over meeting the legal requirement over his ambitious project for luxury apartments at the former council headquarters. Mr Thorpe told the Harrogate Advertiser: “As far as we are concerned we remain under contract on Crescent Gardens and our commitment with Harrogate Borough Council remains as such. "We have exchanged on the building in good faith and acted accordingly. "On Friday our planning consultant, ELG, submitted the bulk of planning documents at 4.05pm on the online portal. "At 4.03pm our team emailed Helen Goulden at Harrogate Borough Council requesting the planning application fee amount. "Our lawyer had earlier on Friday written to the council requesting a short extension until the end of this month for documents relating to elements which had material change. "These changes such as the removal of the restaurant and moving the access ramp in order to maintain the trees were both as a result of the feedback at the public consultation. "Through our lawyer, Michael McGarry, we have offered to supply the outstanding documents and planning fee along with a request for the council to stand by the contract. 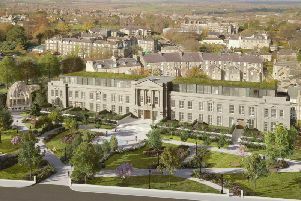 "Michael McGarry is continuing to liaise with the council and their lawyers in order that we progress to a mutually beneficial conclusion of the project for this important building. "We hope that common sense prevails and we can reach a satisfactory agreement with the council to avoid yet another lengthy sales and planning procedure for this scheme.